Available on purchase of selected Wet-Food products. 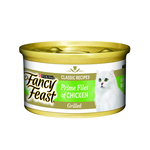 Fancy Feast Classic Prime Filet of Grilled Chicken is a wet cat food made for adult cats. 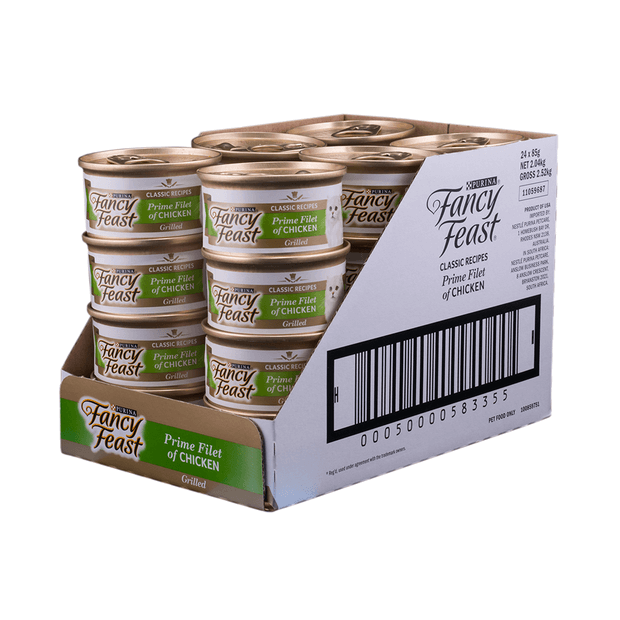 It is part of the Fancy Feast Classic Range, which consists of an extensive array of delicious, mouth-watering flavours. With so many gourmet flavours and textures, even the most fussy eaters will find satisfaction. Prime Filet of Grilled Chicken flavour comes in an easy-open, dainty light green colour label-clad can. This highly palatable wet food is made from tender, juicy slices of chicken dressed in gravy. It is specially formulated by nutritionist to provide a complete and balanced diet for adult cats. Feeding guide recommends feeding 1 can per 1.1kg of body weight per day. After a different flavour? 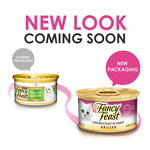 You might like to try Grilled Prime Salmon Filet flavour for the fish-loving feline, or Gravy Lovers Beef Feast for the beef eating kitty. Prefer a dry food? See Pet Circle?s extensive range of cat dry food. Feeding a kitten? Try Fancy Feast Kitten Range. My cat is a chicken lover of the Prime Fillet Chicken Flavor and as the most fussiest eater, I have tried every other cat food brands n she does not like but love this!! I have tried a lot of cat food, this is almost his most favorite one. Fancy Feast changed the recipe approx. 6 months ago, adding an orange-looking gravy. None of my cats have touched it since! My cat loves this, much more than the Hills Science chicken I was feeding her...so I'm happy to be saving alot by feeding her Fancy Feast. She always eats this and prefers it over most other things I've tried to feed her. I'm really impressed with the quality of the food, as it's real shredded chicken meat, not an unknown mushy substance.